Javanese man will be happy if they have : a house, a wife, a singing bird, a horse, and Keris ( Javanese language : wismo, wanito, kukilo ,turonggo, curigo). The world of the javanese keris is centered in the tradition that every man should, if he could, own at least one of these long asymmetrical daggers with the disnating laminations of iron and pamor (nickelous iron).His keris served not simply as a weapon but more as an affirmation of his identily as a mature man and a responsible member of his family and community. The tradition is fading now, especially in post-war urban society, yet many Javanese familes still own keris, valuing them as Pusaka (sacred heirlooms) endowed with a spirit, a magic power of their own. Provided that the keris were regarded with prospect and accorded the proper care and of-ferings, this power might protect the owner from physical danger, bring him wealth, courage or success or whatever else might be needed. For centuries, the widespread belief in the inherent power of their high status in the regalia of javanese kings where they symbolized, along with other sacred heirlooms, the power of the ruler and the mandate to rule. As a man should be jodo (rightly matched) with his wife, so mush he be with his keris in order to feel contentment or satisfaction. Ideally the power believed to be identified with the keris should suit the character and status of the person who acquires it, otherwise he risks being over-whelmed by it and suffering misfortune. Both within Java and beyond, there is a wealth of regional and local variations associated with all as-pects of the keris, from the manner of wearing it to the naming of the parts of the blade. It would be impossible to represent them all. Keris were made in several other islandsof the indonesian archipelago, in Malaysia and in the southern Philippines. The fourteenth century expansion of the javanese kingdom of Majapahit probably brought Javanese blade, sheath and hilt forms to the other islands. Even today, Majapahit or other Javanese bladeare found in the regalia of courts outside Java. 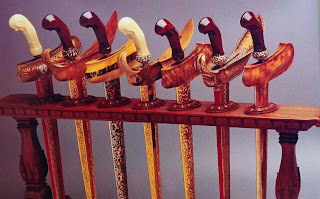 It may be conjectured that keris made in such places as Madura, Bali, Sumatra and Sulawesi were heavily influenced by Majapahit and other javanese styles which they have retained in varying degrees until the present. In java the keris reached its technical and aesthetic height. In comparison to the austere form and matchless technique of the Japanese sword and the directness of crystalline damascening in the Damascus saber, the form of the javanese keris offers vital flowing line and pattern-welding of a uniquely organic character. Thus it seemed appropriate to select Java as a point or departure for study of the keris. It is deeply embedded there, in a complex world of lore and legend, magical and spiritual symbolism, and formal rituals for making, care and use. Much of this worid has ebbed away, yet there remains a small community of skilled craftsmen devoting their days to earning a living from crafts associated with the keris-hilt-and sheath-making, refurbishing old blades or restoring their rich black patina. The art of blade-making is not completely lost, and if this small exhibition stimulates wider recognition and appreciation of what may still be done, what still exists and why itb is important, it will have helped halt the disappearance of a unique cultural phenomenon. 0 Response to "THE JAVANESE KERIS"